Houston is a booming city with over 5,000 energy firms and considered the energy capital of the world. We welcome the petrochemical industry into our city. We give them incentives to develop in our city and in return, they promise to generate economic growth and local jobs. We are giving them tax breaks to aid and encourage their growth, but how often do they keep up their end of the bargain? Chevron was awarded $12 million by Texas to build a new office and create 1,752 jobs in 2013. Three years later Chevron hasn’t even broken ground; instead they have laid off 1,500 workers. These oil companies are not bringing the promised benefits, but their refineries are poisoning locals with their frequent toxic chemical leaks. Why do we have to sacrifice our community’s health for the promise of economic growth? Don’t we deserve to have jobs that don’t harm our people and land? Chevron is one of many petrochemical corporations with oil refineries in the Houston area. Many of these companies are poisoning local communities because they fail to invest in their infrastructure to protect against leaks and toxic releases. Leaks are a regular occurrence and constantly threaten the health of local populations. It is the black and Latino communities that are disproportionately affected by chemical leaks from the oil industry. Everyone is negatively impacted by pollution, but those located closest to a leak will experience the most severe health consequences. The east Houston communities such as Manchester and Galena Park are predominantly Hispanic and comparatively low-income to the whiter west communities. The east side contains more high-risk industries and suffers higher levels of toxic air pollution. It’s not a coincidence that the communities next to these refineries are minorities. These communities are located near the industries because of a number of interconnected factors such as race, socioeconomic status, history and city development patterns. As a result, these minorities are the most likely to be poisoned by the corporations. It has been more than seven months since Harvey hit Houston. During the catastrophic flooding, the petrochemical industry released thousands of tons of chemicals into our environment. We have started the recovery process, but we don’t all recover at same the rate. Everyone was impacted by Harvey, but some communities will take longer to recover. Neighborhoods surrounding industrial areas not only have to rebuild, but also consider other risk factors including land contamination, long-term health risks and devaluation of property caused by the toxic chemicals. We have to rebuild as a city and can’t leave any community behind if we want to thrive. Gov. Greg Abbott’s administration decreed that the storm-related pollution would be forgiven as “acts of God.” By doing this, the governor is giving the oil industry a pass for the leaks during the hurricane. The hurricane was unstoppable, but the oil companies chose to locate their factories in a hurricane zone. This fact alone should have made them responsibly engineer their refineries to withstand the worst possible weather disasters, as well as having a comprehensive disaster management plan put in place. Hurricane Harvey could not be stopped, but the toxic releases could have been prevented by building the refines to withstand extreme weather. This creates a precedent and does not incentivize these companies to build better facilities and prevent toxic releases during future natural disasters. This is not OK! Instead of protecting the people, Abbott is protecting the industry. We cannot allow this. Why should we choose between jobs and protecting ourselves and the environment? The state government needs to hold these companies accountable for leaks and provide equal protection to all of Houston’s residents. 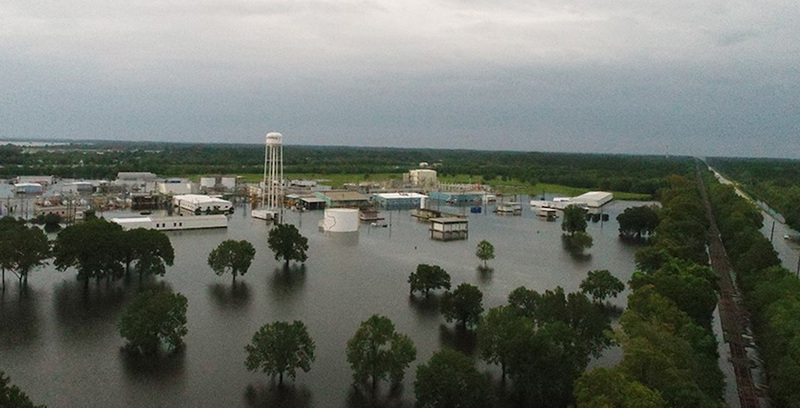 The chemical industry should be legally required to build their plants to safely withstand local conditions, required to clean up after leaks and keep locals informed. They should pay fines to the government, pay damages to impacted communities and be held accountable. This is not a lot to ask: if you make a mess you should be responsible for the consequences!